Jayne Kamin-Oncea/Getty ImagesLeBron James has already been in the NBA for 15 years, but says he plans to play for five or six more seasons so he can take the court with his son. 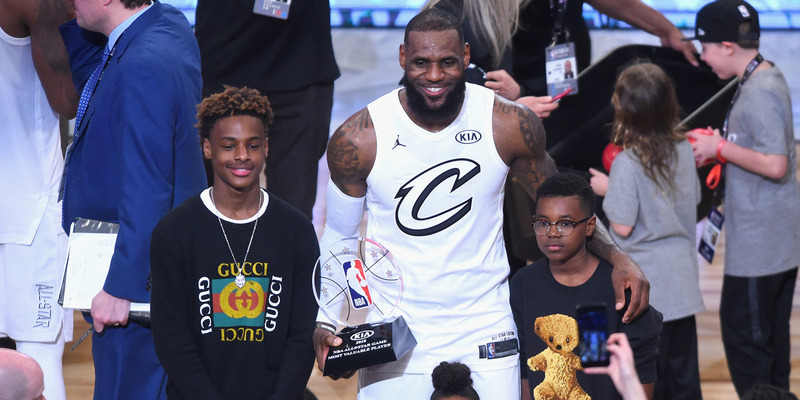 LeBron James recently expressed his desire to remain in the NBA long enough to play with his son, Bronny. Bronny James is 14, but could potentially enter the league in five or six years depending on how the NBA’s eligibility rules change before then. The declaration means James hopes to play over 20 seasons in the NBA, and he’s already taken numerous steps to ensure his longevity. LeBron James has already put together one of the greatest careers in NBA history, but even in his 15th season, don’t plan on him leaving the league any time soon. James and his trainer Mike Mancias recently joined Tim Ferriss on his podcast to talk about James’ lifestyle, habits, and what he’s learned as both a father and NBA superstar. 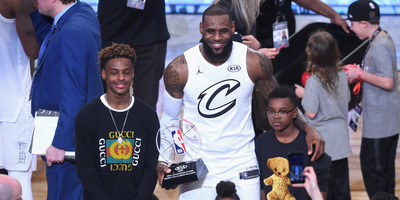 Near the end of the interview, Ferris asked how long James planned to continue playing in the league, and James was quick to answer – as long as it took to take the court with his son, Bronny James. James had previously hinted at his desire to play with his son, but this was a much more full-throated declaration of his wishes. Playing five or six more seasons would put James with over 20 years of NBA service – a long career, but one becoming more and more common amongst great players that have learned to adjust their roles as they age. For Bronny’s part, he just turned 14 but has already received offered from some of the top schools in the country, and on his current trajectory, would almost certainly be a one-and-done player. Further, there’s a chance that by the time Bronny is a senior in high school, the NBA will have changed the rule to allow players like James to enter the league straight out of high school as his father did before him. While it’s far more likely the father-son duo end up on opposite teams thanks to the NBA Draft, it’s almost too enticing not to imagine the two teaming up together – depending on the elder James’ contract status, nothing is impossible.